Book 9 of the Sookie Stackhouse Southern Vampire Mysteries. 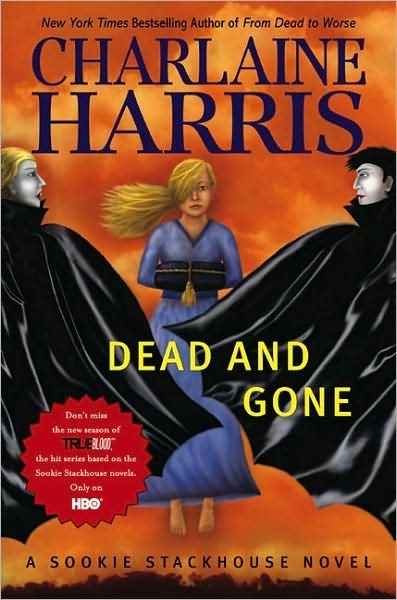 With Season 3 of HBO’s “True Blood” starting and the recent publication of book 10 of this series, “Dead in the Family,” I decided to get to jumping on the continuing adventures of Sookie Stackhouse from Bon Temps, Louisiana and her life dealing with the supernatural. Sookie is pretty much the average bar waitress in a small town in Louisiana, it’s just that the rest of the world going on around her is way beyond the average. You see, in these novels the vampires have “come out of the coffin,” which is to say they have revealed to the rest of the world that they do indeed exist. With the invention of synthetic blood, “True Blood,” they no longer have to prey upon humans for their food source. This coming out has created some very interesting times for the world and especially for Sookie Stackhouse. There have been some bad times because of the vamps coming out. One of those is for a religious group taking offense to the existence of vampires, saying they are an abomination. This group calls themselves “The Fellowship of the Sun,” and they are always wreaking havoc upon the vampires. Okay I say Sookie is pretty much average she does have one “disability,” she can read people’s minds. So as you can figure she doesn’t have much of a dating life because she knows exactly what her date is thinking. Enter the vampires. Sookie discovers that (for the most part) she cannot read the thoughts of vampires. With this she finds relief finally she can be with someone and not learn of their deepest darkest secrets. She falls in love with a vampire and then learns of a whole new world that exists within the realms of the “real” world. The supernatural world not only consists of Vampires, but also; werewolves, shapeshifters, witches, fairies & fae, goblins and probably more. In the previous novel Sookie has just found out that her great-grandfather is a prince of fairies. He is one of the last remaining fairy royalty. This makes Sookie part fairy, and explains why she’s so attractive to vampires (vampires cannot resist fairy blood) also this may explain her “disability.” In this novel it seems as though the fairies are not happy with the intermingling that has been going on with humans. This starts a civil war amongst the fae and Sookie’s great-grandfather, Niall, has come to warn Sookie that her life may be in danger. The fairies all want to go into their own world and never again return to the human world, but before they leave they want to remove all traces that fairies ever existed. This means killing those that are part fairy, like Sookie and her brother, Jason. As if this weren’t enough, the Were community (which includes werewolves, were panthers [Jason Stackhouse has been turned into a werepanther], were tigers, were foxes and shapeshifters of all sorts) have decided to also reveal themselves to the world since the vampires have been pretty successful with their reveal. They do so on television nationwide and in prominent areas have representatives shift into their animal form so the normal humans can see. This includes the bar where Sookie works. Sam, the owner of the bar where Sookie works, and a true shape shifter (he can shift into any animal shape)reveals himself to the community. Many folks take the big reveal with little unease. After all they have vampires, why not werewolves. At least that’s how it seems at first. The next day, Jason’s ex-wife and werepanther, Crystal Norris is found crucified in the parking lot of Sam’s bar, Merlotte’s. Sookie is determined to find the killer. In the vampire world Louisiana is just getting into the groove of the new King of Louisiana, and the only remaining original sheriff of the vampires, Eric Northman, in order to protect Sookie from becoming a slave to the new King, tricks her into what can be seen as the vampire equivalent of marrying Eric. Sookie seems at first upset, but then again, she does have feelings for Eric, so she decides to see how it plays out. Soon the fairies attack and Sookie is forced to call in all her markers from the werewolves, the vampires and the witches to keep her safe, but the war begins and Sookie is kidnapped by fairies, keep in mind these aren’t your Tinker Bell type fairies…these are vicious killers. The war is on and Sookie is in the middle, can she be protected? Will she find Crystal’s murderer? You’ll have to pick this one up yourself and find out. Here’s a clue…there is a book 10 in the series and this one is number 9.